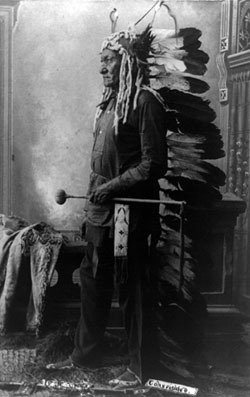 Chief Sitting Bull is one of the most well known famous American Indians. Chief Sitting Bull was born around 1831 in what is now South Dakota. Chief Sitting Bull is a very well known Native American due to his battle and victory over General Custer. Yet even before this period of his life he was working to better the way of life for his people. When Chief Sitting Bull was younger he became leader of a group warriors called the Strong Heart Warrior Society. Later he went on to become a distinguished member of a group known as the silent eaters, a group greatly concerned with the well being of the tribe. Chief Sitting Bull was famous for his bravery; he first saw battle at the age of 14 in a raid against the Crow tribe. And he had his first battle against the American military in 1863 when the military marched forth in retaliation for something in which Chief Sitting Bull’s people took no part. In 1874 it was determined that there was gold to be found in the black hills, this area was sacred to many Indian tribes and they made a vow to never let the white man trespass on this sacred territory, this land was also protected for the Indians by a treaty which, upon discovering the gold, was cast aside as with many of the treaties signed with the Indians. Chief Sitting Bull called forth two other tribes to come and join his people at their camp. They performed the Sun Dance ritual and Chief Sitting Bull slashed his arm 100 times in sacrificial offering, during the ritual he had a vision of American soldiers falling from the sky. Inspired by this vision of Chief Sitting Bull, Chief Crazy Horse took his warriors into battle and pushed the soldiers back. After the victory they moved forward and joined with 3,000 more Indian warriors who were heading to join Chief Sitting Bull. At this camp is where General George Armstrong Custer, who even though was badly outnumbered, rushed the encampment of Chief Sitting Bull. The troops rushing in coincided with Chief Sitting Bull vision of the soldiers falling in on their camp, the troops were beaten and pushed back, and soon after they were wiped out by the Indian warriors.